February 2018 - Pebbles, Inc.
Hello Pebbles Friends! 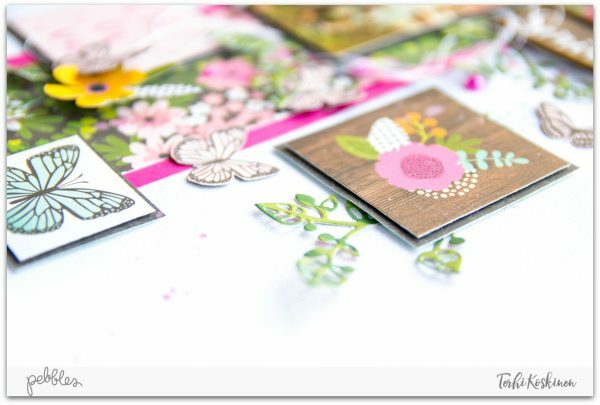 It’s Leanne here today, sharing some quick and easy ideas on how to make Project Life Filler cards in under 30 minutes! I’m sure we all struggle at times with project managing and hoping we can document every moment! Sometimes our projects can take days, weeks even and we sometimes lose our momentum. I know this is an occurrence that I come face to face with throughout the year on a semi-regular basis, but my simple method for overcoming a limited mojo, is giving myself a time limit to create in. A half hour of creative play is all it takes to burst the bubble and push forward to complete creative projects. 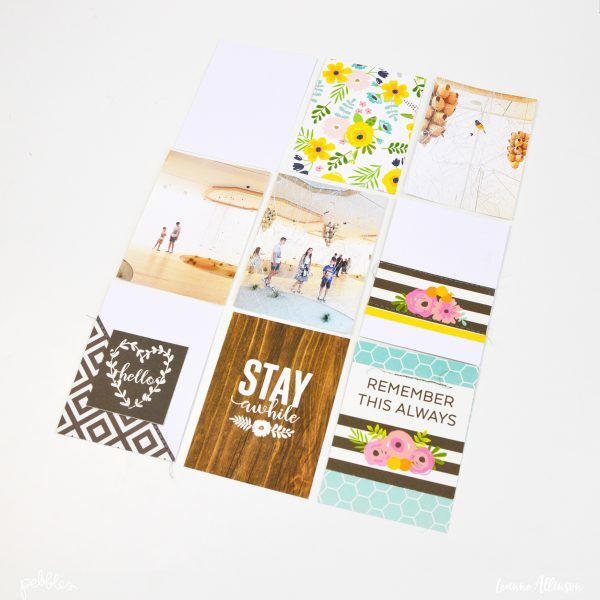 Project Life filler cards are one of the easiest projects to play with. 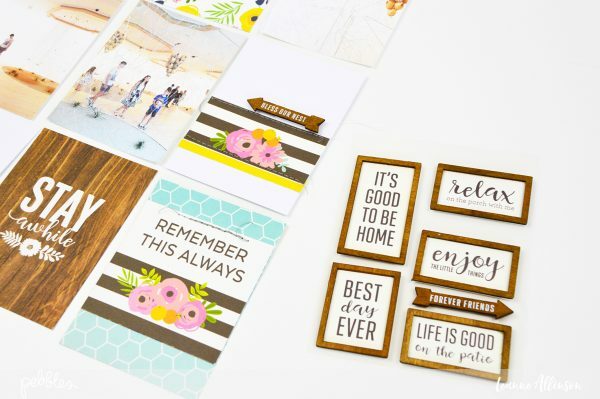 If you are not a Pocket Page enthusiast however, these 3×4 cards can be converted into regular gift giving cards. I generally gather my supplies before any project and look at the colours and patterns available for suitability. I wanted to create a pocket page about an art exhibition I saw with my children, which involved uncaged birds. 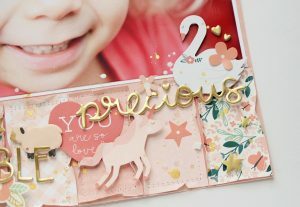 The new Patio Party by Jen Hadfield is just divine and ideal for my pocket page spread. The next step is to select photos that will help maintain the focus of the story without losing impact from the pretty papers! Once I have my base layout design, using three photos, three blank pieces of cardstock and three pieces of patterned paper, I am ready to start building up my layers. When creating PL cards, I love to use basic elements with a twist. 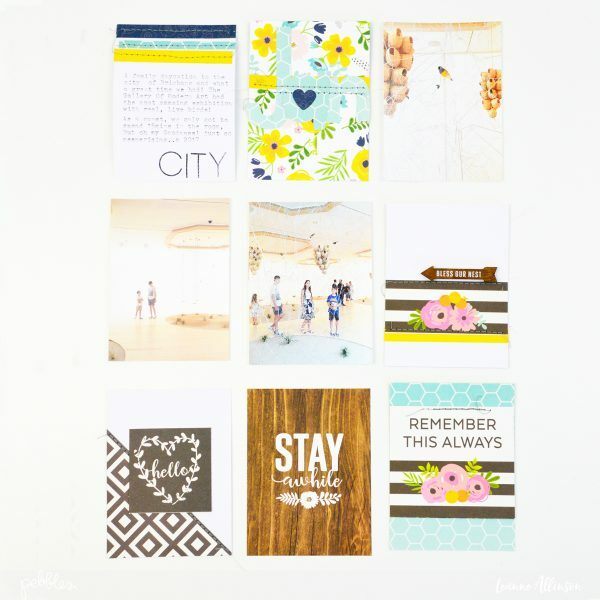 The simplest form of design involves a 3×4 cardstock base and 3×4 sized patterned paper. 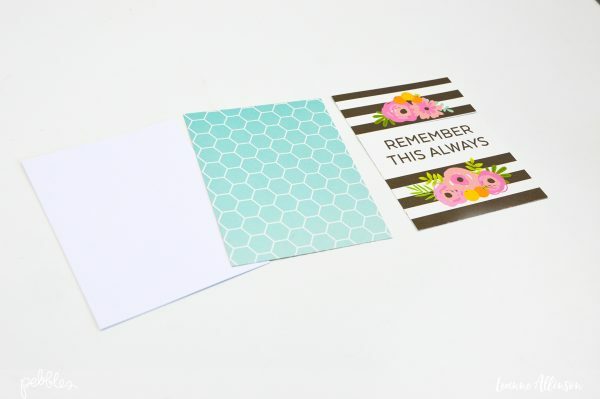 Ensure patterned paper and cardstock are the same width. Trim the patterned paper on the diagonal. Adhere the patterned paper to the cardstock. For extra effect, add a row of machine stitching. 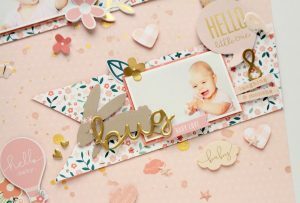 Layer the PL filler card with a cut apart sentiment from the same collection to maintain a cohesive look. This PL card took approximately five minutes to create from start to finish! 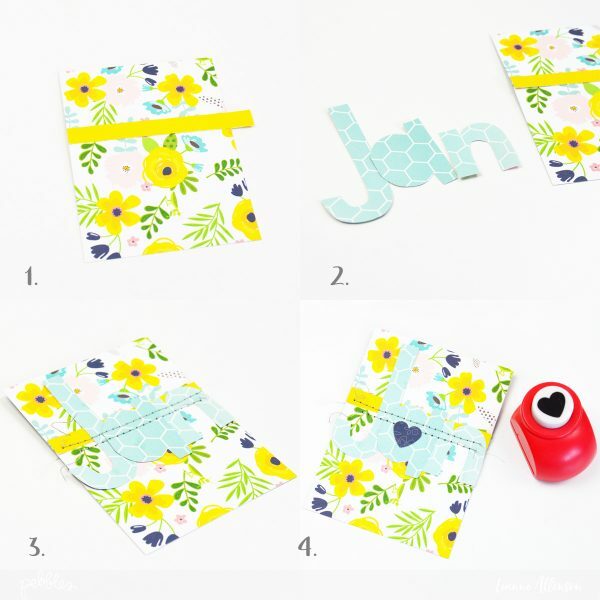 The next stage takes the same amount of time and you can create two from three pieces of cardstock or patterned paper. 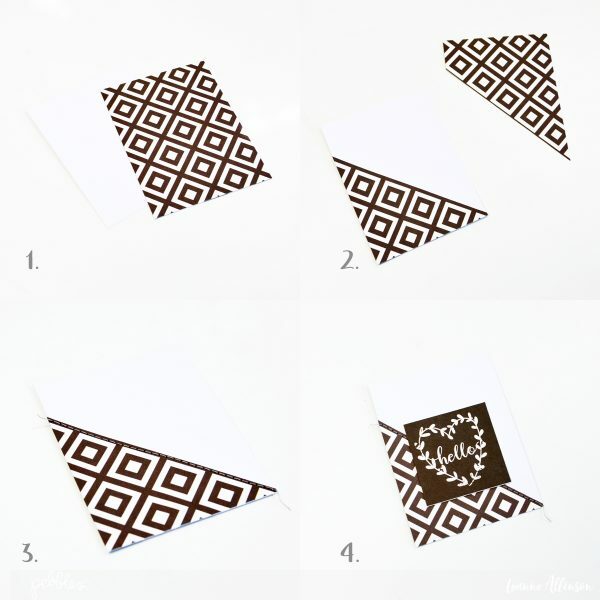 Trim both cardstock and patterned paper to size – 3×4. 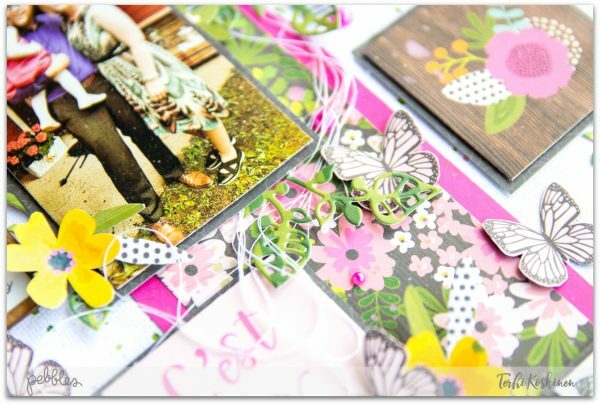 Measure one third down from the top of the cut apart card with a journaling sentiment and trim. Adhere the larger piece of the journaling sentiment card to the patterned paper and machine stitch close to the top of the sentiment. 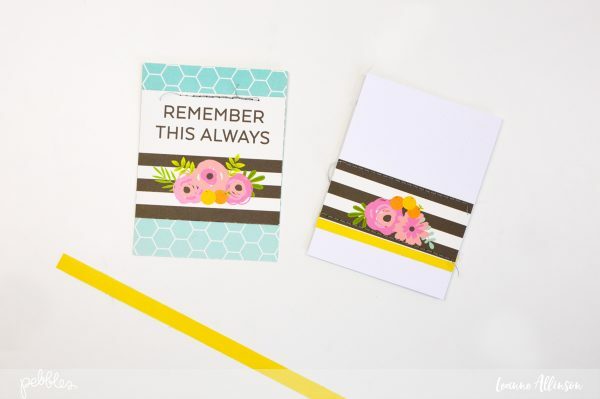 Add a thin strip of contrasting patterned paper beneath the smaller journaling card sentiment when attached to the cardstock. Machine stitch at both the top and bottom of the patterned paper. After I have created a few PL filler cards, I like to slip them back into the over all design, to see where I can add extra elements or create a visual triangle for the entire spread. On the previously created filler card, I wanted to link the visual element of woodgrain from one of the patterned papers used below it in the spread. 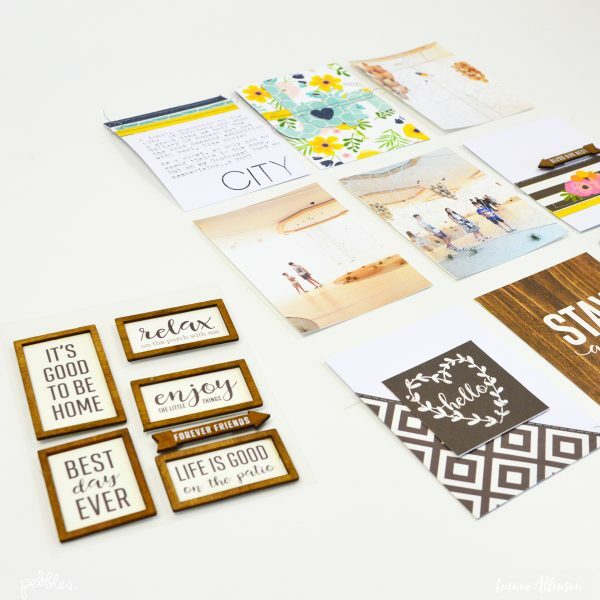 I selected the woodgrain arrow, not only because it’s really cute and a colour match, but the sentiment is perfect for my story! I love it when little details come together like this! To complete my pocket page spread I now need to just add my story. Remember, the object of starting this project was to complete it in under 30 minutes. The title card also falls under this category. I didn’t even break out any die cutting tools, but just used a pair of scissors and started freestyle cutting. Create a focal point for the title to sit on. Repeating the use of similar patterned paper strips used in other PL cards forms a cohesive appearance. Plus it is also easy to use what is already sitting on your desk. Machine stitch the title into place on the patterned paper base. To draw the eye towards the title work, add a paper punched heart to represent the negative spaces in alphas. 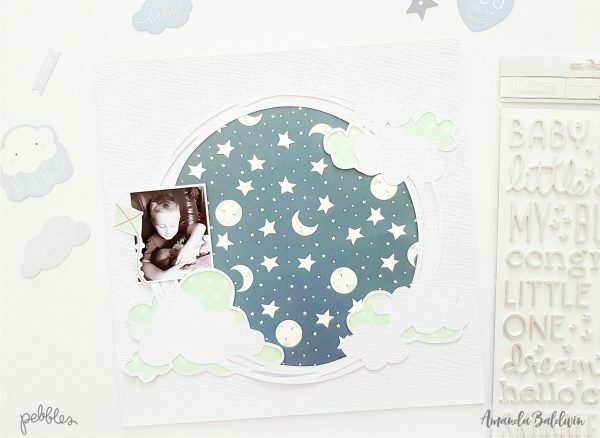 The final cardstock base has been set aside specifically as a journaling card. 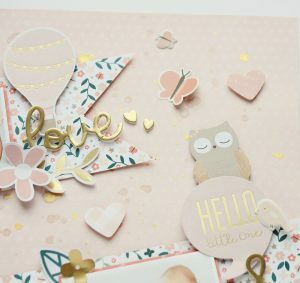 However, to have a unified feel to the overall spread, coordinating paper strips have been added to the top of the card before typing the journaling. 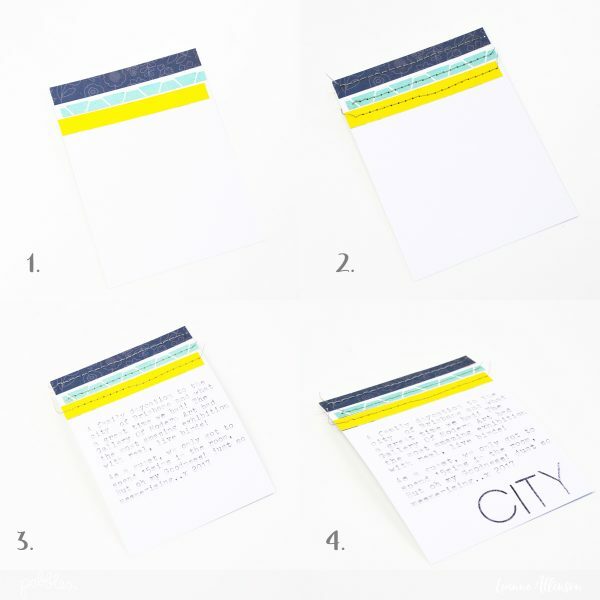 Add thin paper strips to the top of the card. They don’t need to be even or perfectly aligned. Machine stitch directly across the top of each paper strip. Run your card through the typewriter or hand write the story. 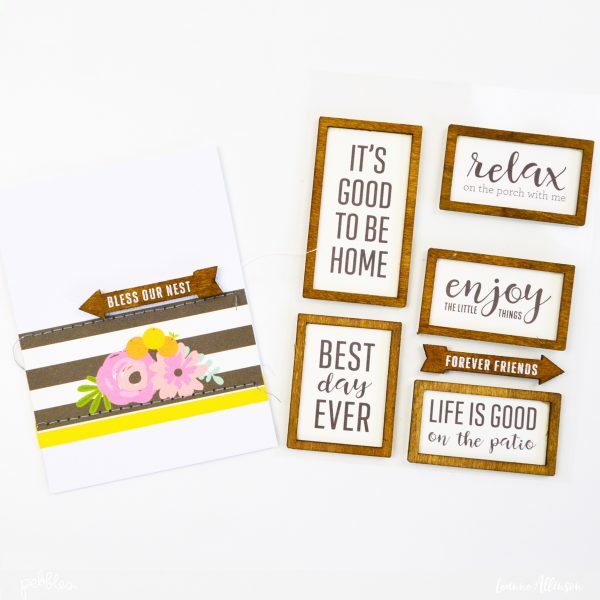 Stamp a simple sentiment or word at the bottom of the card to reinforce the story. Finally lay out the spread as it will be displayed in the pocket page. 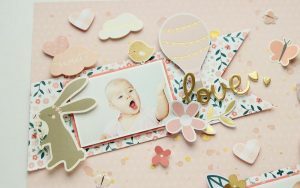 Add any extra embellishments to suit the documentation process then sit back and admire the work you’ve just complete in under 30 minutes! One pocket page spread has now been completed using three cardstock bases, three pieces of patterned paper and three photos. It doesn’t get much easier than that! Hi everyone. 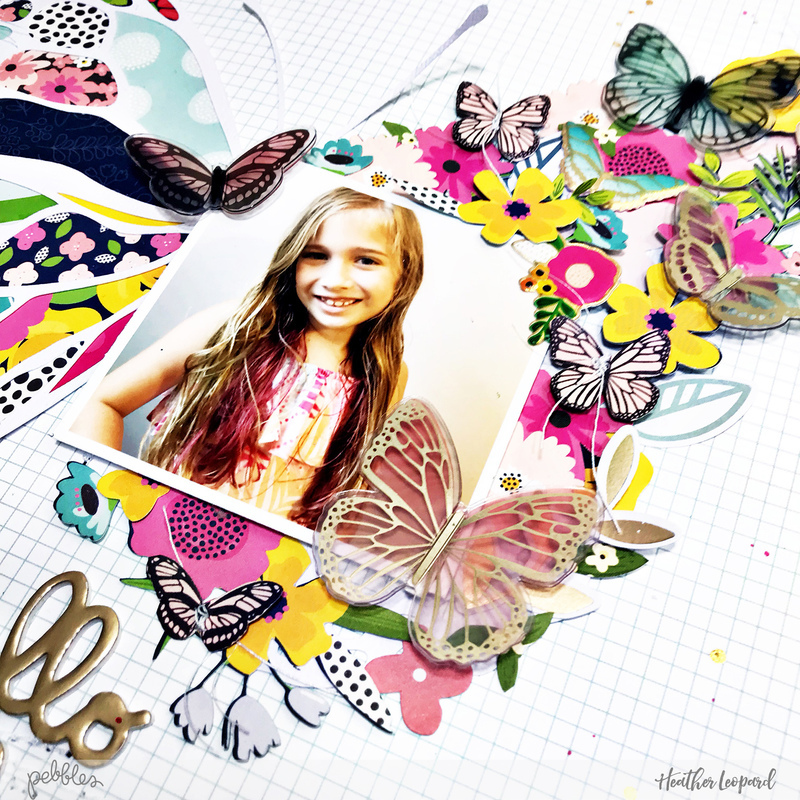 Heather Leopard is here with a butterfly scrapbooking layout that can be completed in 45 minutes if you have the right tools and can work fast. To help you along the way, I’ve documented the process in the video at the end of this blog post. 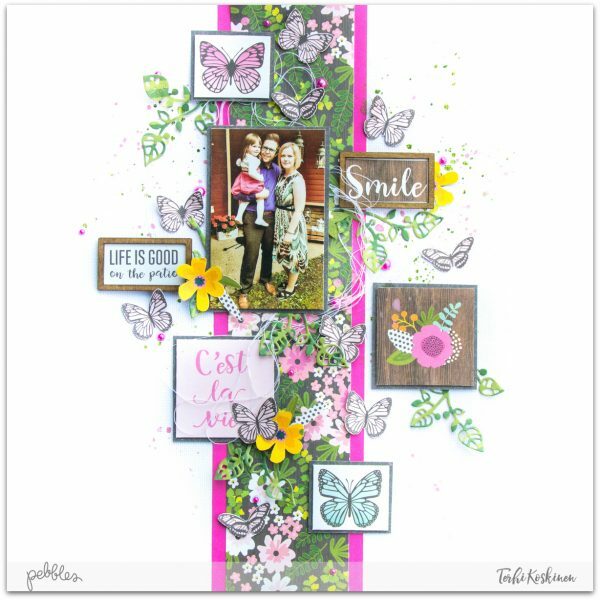 Once you get the patio party collection in your hands, or any other supplies you’d like, you can follow along with me to create this fun layout. To get started, cut a supersized butterfly using your electronic cutting machine. 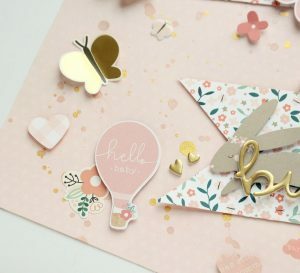 Peel the butterfly from the mat and also save the larger bits you cut out to use as templates for filling in the holes with patterned paper. 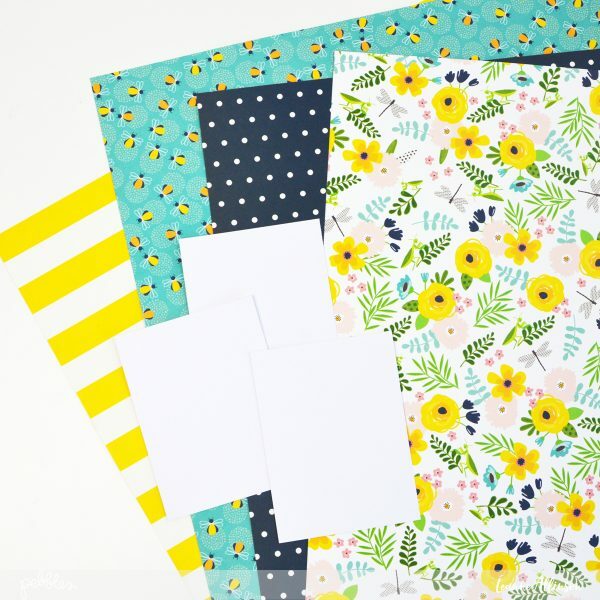 Next, choose 5 – 7 coordinating patterned papers. This is where you could spend too much time overthinking things. DO NOT overthink the pattern placement. If you are working with papers within the same collection, chances are they will look good next to each other. Just pick up a paper and get started…Starting at the top, select the template you reserved from the butterfly. Place it over your patterned paper and cut around it, leaving just enough edge around the perimeter – maybe 1/8″ or 1/4″ inch. It just really depends on the design. Once you’ve cut that out, discard the template and adhere the patterned paper to the back of the butterfly. You should have a perfect or near perfect fit. Repeat until all spaces are filled. 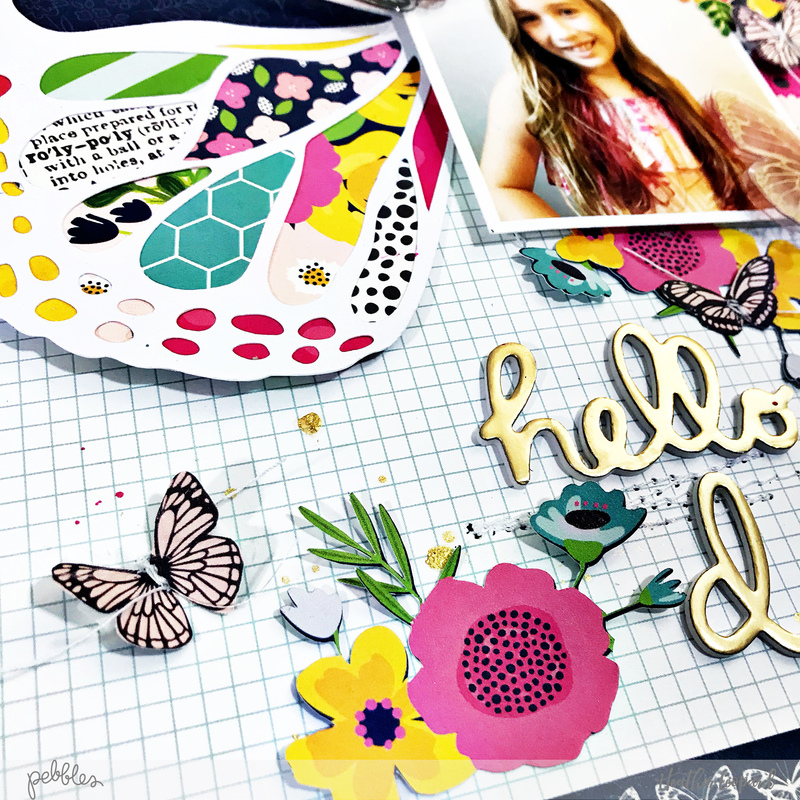 Secure the butterfly to the page, machine stitching down the center and adhering the left patterned paper side with foam dots. 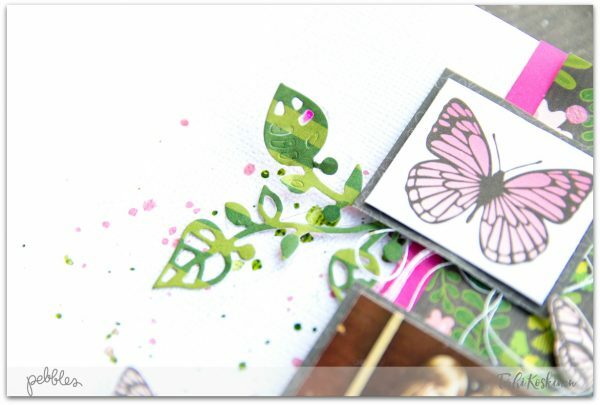 Next, you are going to add flower and butterfly embellishments to the top of the other side. 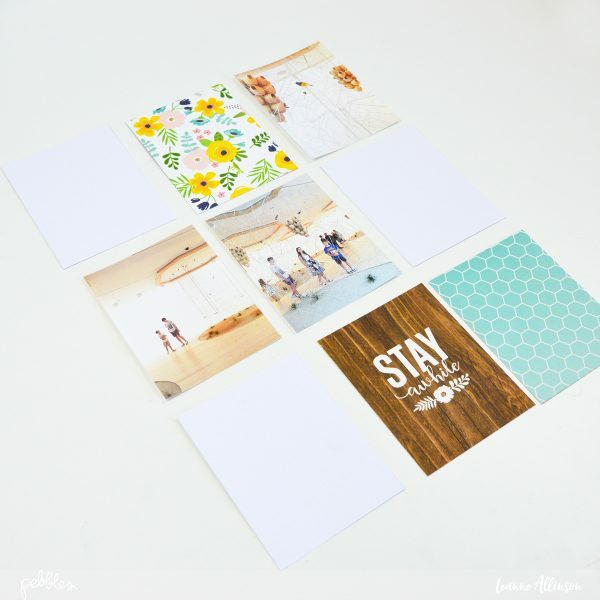 Make sure you save space for your photo (I used a 3″x3″ inch photo. I adhered my photo using foam dots and then filled in around it, adding flowers and butterflies. Once that was complete, I moved along the butterfly, adding flowers and butterflies along the edge of the butterfly and working inward to fill in all the spaces. I adhered some directly to the paper with liquid glue and I popped others up using foam dots. I worked this pretty fast to fill in all the spaces. 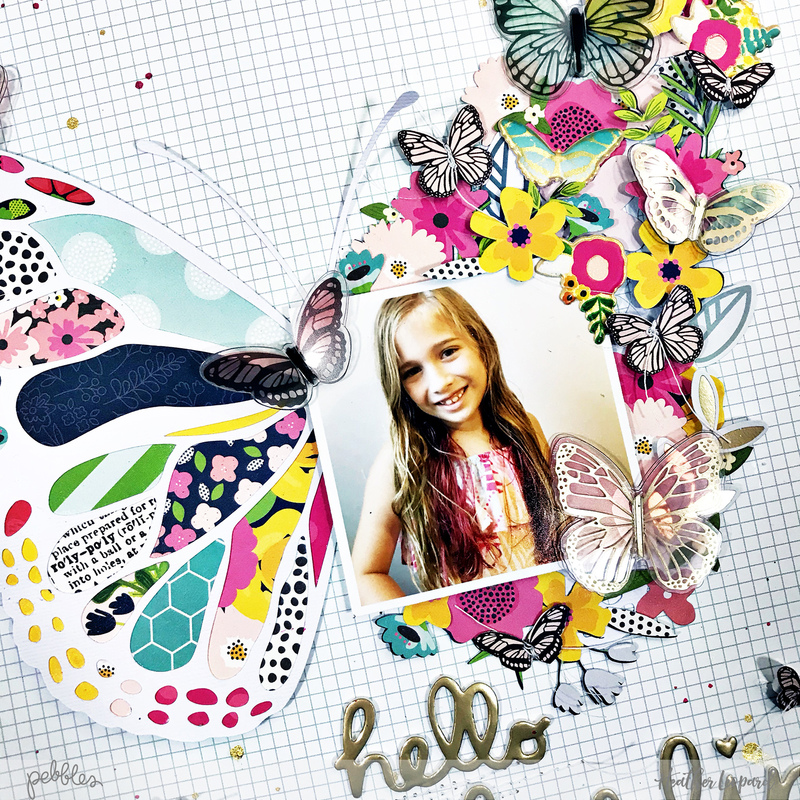 In the time remaining, you just need to add a title, a cluster or flowers / butterflies on the patterned paper wing and around the title and journaling. 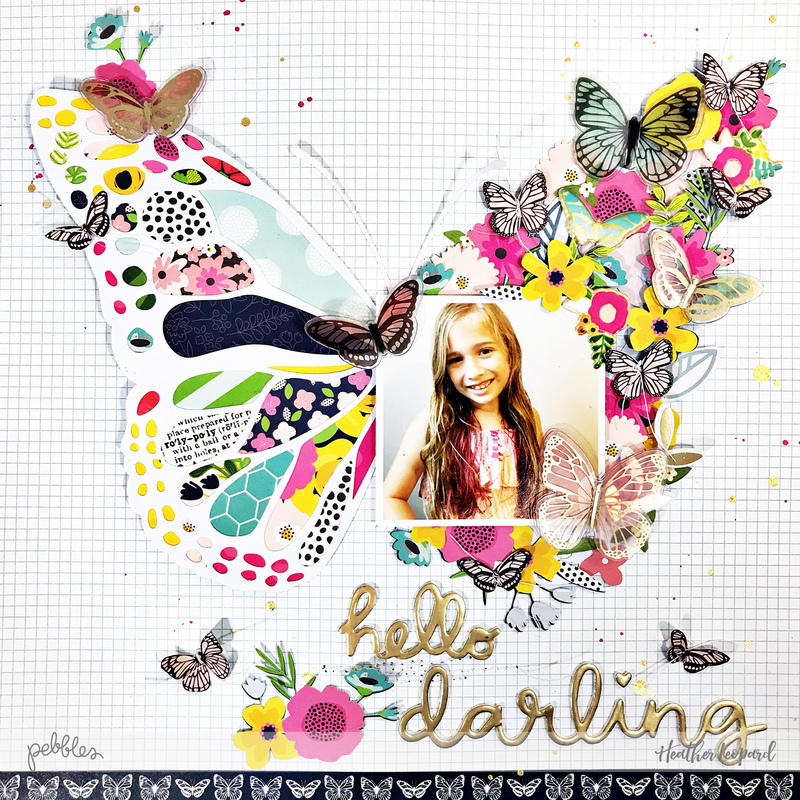 As promised, here is the process video I created for this butterfly scrapbooking layout. I sped up the time so you don’t have to sit and watch me for 45 minutes. Remember: don’t overthink this, you too can re-create this in under an hour, maybe even 30 minutes if you don’t have any interruptions. Hello Pebbles fans! Terhi here super excited today, as it’s my first time here with the prettiest collection of the year: Patio Party. I mean, it is like heaven on earth and I can’t stop smiling when ever I see the beautiful and happy colors and patterns of this line. As soon as I received my box of Patio Party goodies, I knew I finally found perfect papers for scrapbooking a photograph of my friend and her family. 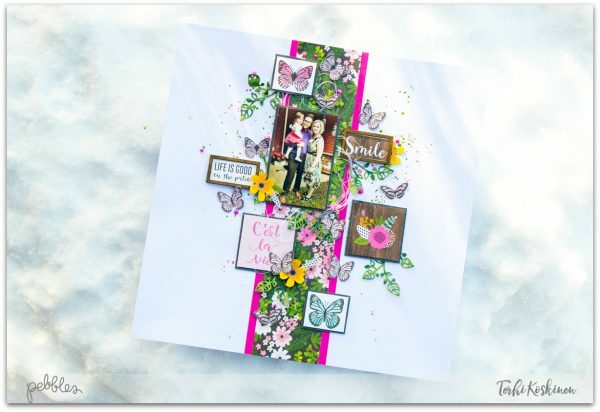 I started by just cutting Patio Party ‘From Me To You’ paper and picking up the images I thought would fit to the layout. I also cut handful of butterflies from ‘Flutterflies’ paper. 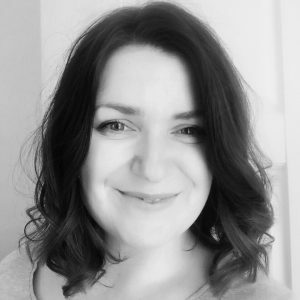 Then, with having the photograph in the middle of the page all the time, I thought about the page design: what do I want to show and what would give the small photograph the most eye catching spot from the page. Couple of darker papers ended up to the background, and the photograph stayed in the middle. Sometimes less really is more! 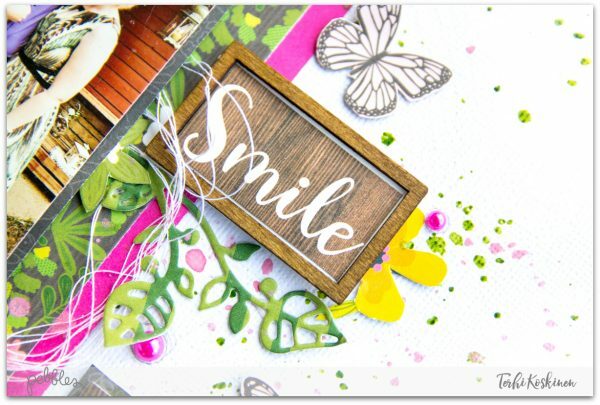 The funniest trick to share about this page is that I picked up one of Wood Stickers and glued ‘smile’ word on top! Love those Wood Stickers so much and I was desperate to add two of them to this page, placed horizontally. Just changed to word, and it fit well! To give perfect balance for the page (and to give a small hint of a growing family) I used my electric cutting machine to cut some really delicate green flourishes. It was a small thing to do, but I think those little green leaves behind other elements are making the layout more live and they match so well together with the floral patterns on the other papers. I hope you find this page inspiring! Have the most wonderful week! A Love Bug [and more] with our Guest Designer Anna! Hello everyone. My name is Anna and I am so happy and honored to be a guest designer for Pebbles. I am a big fan of Pebbles products and I had the great pleasure of working with the brand new “Night Night” collection. As a mom of two girls, I chose the girly version with lovely pinks and cute critters. 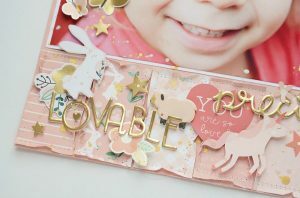 My first project is a layout called “Lovable”. 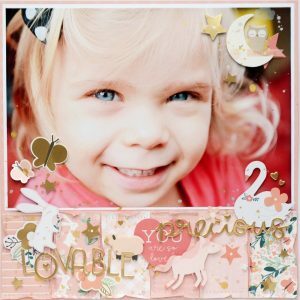 I used a big picture of my cute daughter Maja and embellished it with with paper scraps and smaller elements. 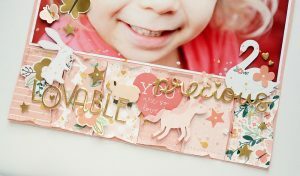 I picked several patterned papers to create a background for my embellishments. They all share a similar color palette, so it was easy to just group them. I added a lot of embellishments, such as ephemera pieces and stickers. Adding pieces of sticky foam helped me to create a great texture and dimension. I didn’t forget about the picture itself as I didn’t want to cover too much of it. Smaller embellishments like butterflies and the small moon turned out perfect. 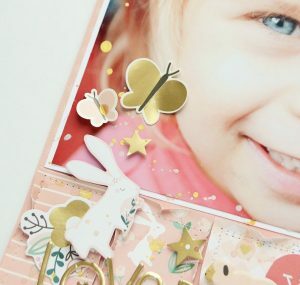 Golden thickers look fantastic and they are awesome for making titles. My second project is this diagonal type of the layout with two pictures from the same photo shoot. I decided to go diagonal to add some special interest and dynamics to this page. Combining cute ephemera pieces and stickers is always a good idea…and those critters are so adorable. 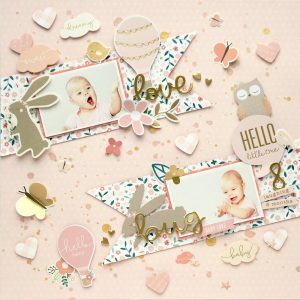 What can match better with the baby pictures than a cute bunny, swan and owl?! Once again i used phrase thickers to create a title. I love the mix of fonts and sizes. 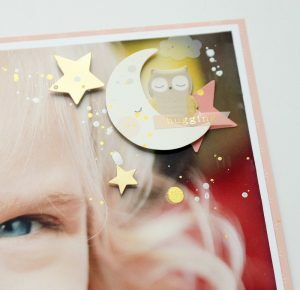 I hope my projects inspire you to grab some baby photos and the lovely “Night night” collection and scrap some precious memories.